For a while, quarterback Tom Brady and receiver Wes Welker were a winning combination on the Patriots. When Welker left for the Broncos, Julian Edelman filled his spot, and he performed that role well. Too well. Welker appeared on Boston radio show Toucher and Rich today, and the hosts brought up the pattern: Whenever Brady does something, Edelman does a less interesting version of that. Brady meets Kevin Durant to help out the Boston Celtics; Edelman posts a photo of himself in a jersey. 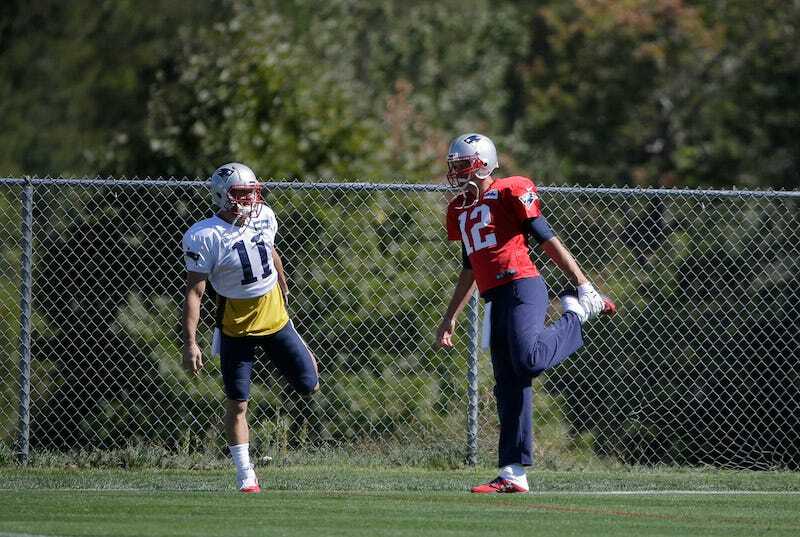 Brady has his TB12 brand; Edelman has JE11. It’s not unusual for a QB to be close and friendly with his favorite targets, but Edelman is a unique and amusing case. Welker, who noted that Edelman openly admits his coattail-riding, compared the relationship to generic store brands. “I think it’s like going and getting Advil, and then there’s like the Walgreen’s prescription next to it,” he said. “If Tom Brady asked Julian Edelman to commit a crime, do you think he would do it for him?” Rich Shertenlieb asked.